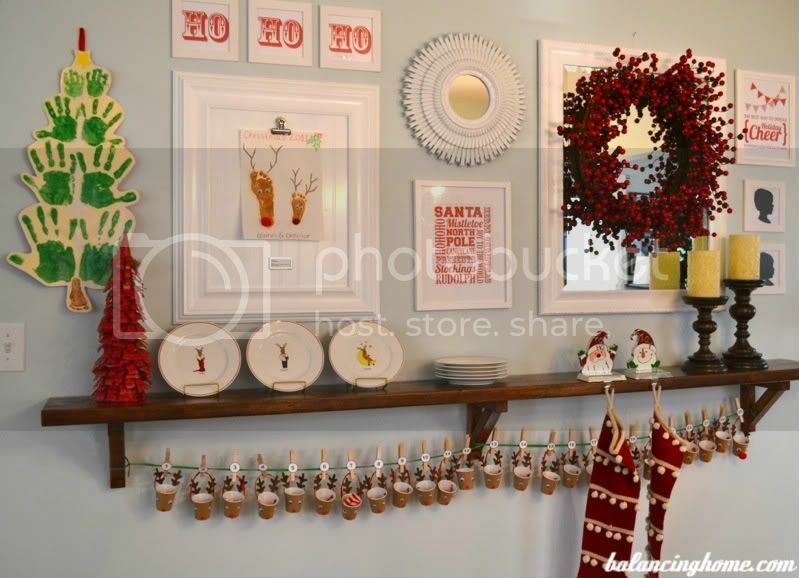 Finally got the advent calendar up…this morning! Each cup has a peanut butter cup (Quinn picked it). The little scrap of fabric will move along as a marker. This isn’t the permanent home for the advent calendar. The permanent home is getting built (more on that later). 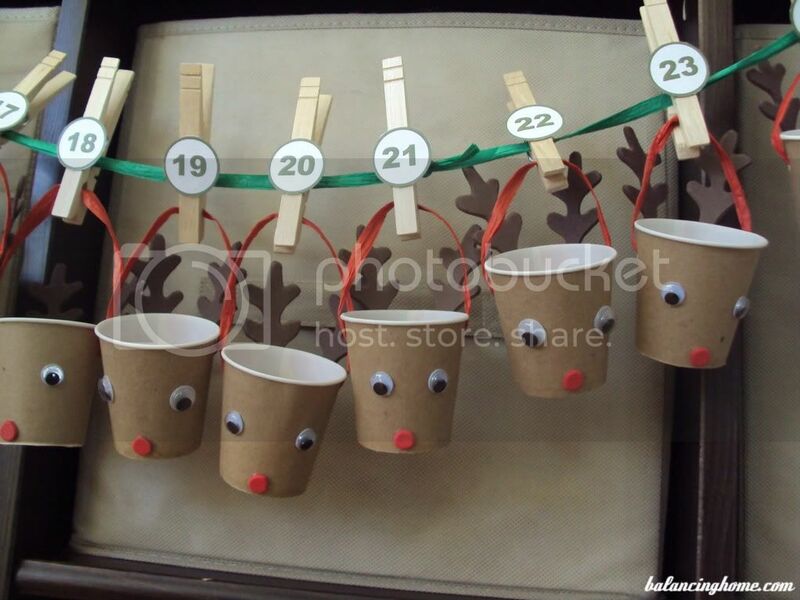 So the reindeer need bigger noses, but I am all advent calendar-ed out. Maybe I will go back and fix up the noses later. This project took way longer than I imagined. Y’all ever have projects like that? 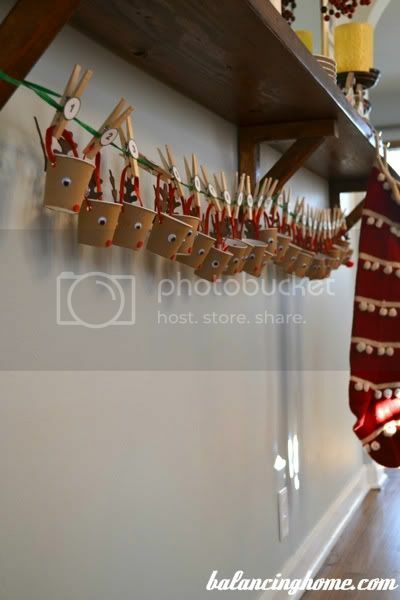 After how many inquiries into how I made this reindeer advent calendar, I finally went back and checked out the post. I was shocked to find I never included a tutorial. My apologies. String (yarn, rope, twine, raffia, wire, etc.) 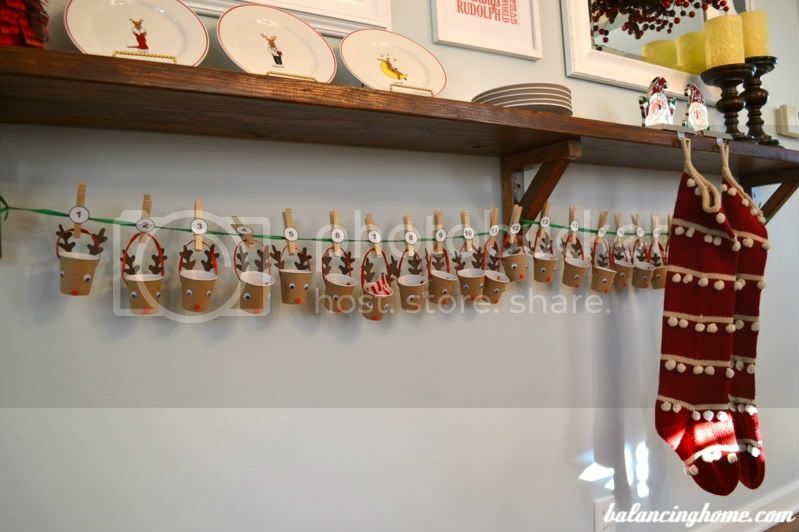 for handles & to hang cups on. Foam paper in brown and red. Cut down the seam of the paper cup and cut off the bottom. Flatten the side of the cup to create a pattern. 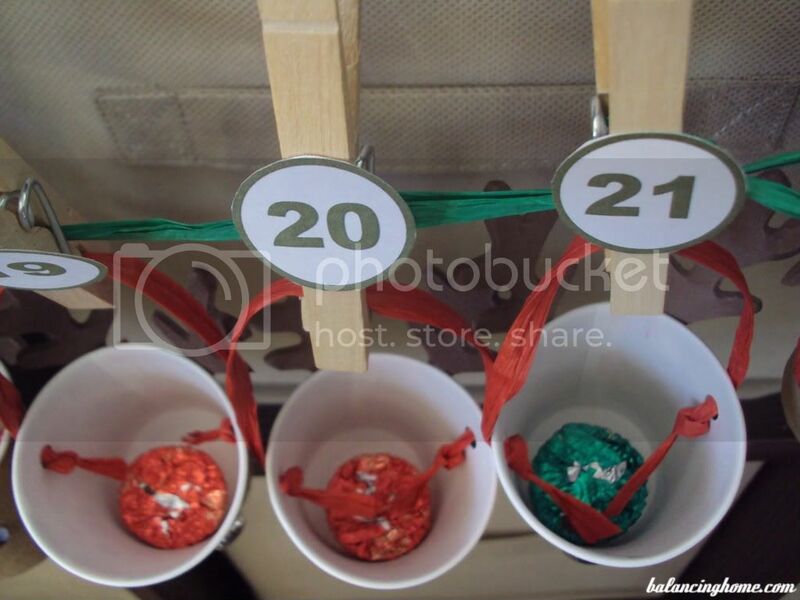 Trace and cut out 25 cup wrappers. Cut 25 pieces of string and punch holes in side of cup. Attach string to cup by putting string through the hole and tying a knot. 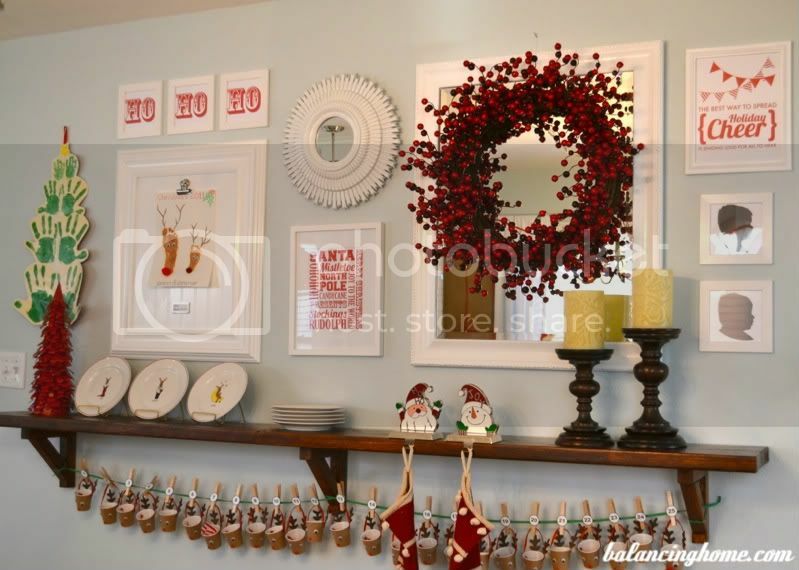 Create or google a reindeer antler stencil. I free-handed mine. Trace antler on to brown foam and cut out 50 antlers. 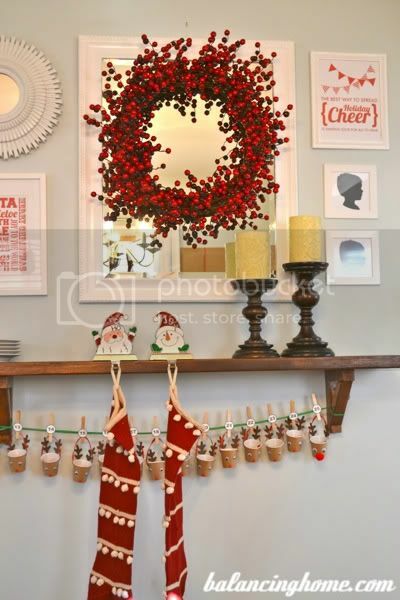 Glue antlers on to back of cup. Cut our 25 noses from your red foam. You could always substitute with puff balls, but I didn’t have any on hand. Cut out your numbers and attach them to your clothespin. I used sticky dots, but good old fashioned glue works fine too. Hang string. 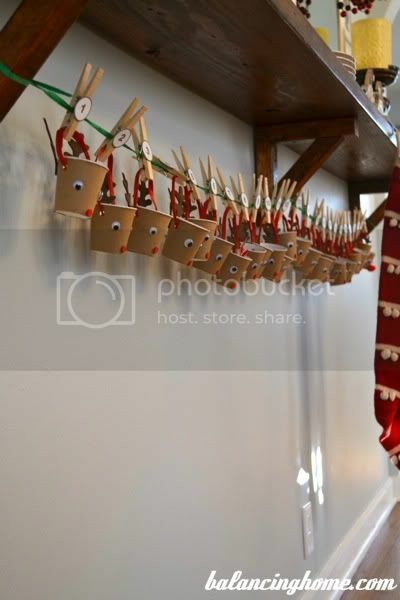 Attach cups to string in numerical order using clothes pin. Hopefully this clears up any confusion. Best of luck!